The purpose of these procedures is to ensure that donations and bequest income and expenditure is identified and recorded appropriately within the University’s financial management system. Donation - gifts given without return consideration. Bequest - act of giving in a donor’s will. Endowment - donation or bequests invested by the University to generate operating income. Pledge Reminder - replaces a tax invoice for the collection of philanthropic pledge payments. Raiser's Edge - donations and bequests management system managed by the Advancement Office. These procedures apply to all donations and bequests received by the University. Donations and bequests to the University are managed by the Advancement Office. For further information on sponsorships and philanthropic grants, refer to PPL 8.25.01 Philanthropy and Fundraising. Projects are created by Contract & Grants Accounting Section within FBS and are required where the income and expenditure needs to be separately identified. Certified financial statements required or requested by donors, are prepared by Contract & Grants Accounting Section within FBS. All donations solicited or unsolicited, are to be forwarded to the Advancement Office for processing. The Advancement Office shall oversee the receipting, recording, depositing and acknowledgement of contributions to the University of a philanthropic nature. An official receipt will be issued by the Advancement Office in a form suitable for taxation purposes and sent to the donor. In addition, a formal letter of acknowledgement signed by the Vice-Chancellor will be sent in the case of large donations. Refer to PPL 8.25.01 Philanthropy and Fundraising. an Asset Addition Form, where a material non-cash gift has been provided and it falls under the definition of plant and equipment refer to PPL 9.50.02 Property, Plant and Equipment or portable and attractive items refer to PPL 9.50.03 Portable and Attractive Items. Before a donation can be accepted it is necessary for the University to ensure that the intention of the donation is compatible with the aims and objectives of the University. In addition, the University must ensure that the donation does not compromise its status as an institution under the Income Tax Assessment Act to which donations are deductible to donors for taxation purposes. The University of Queensland is a tax-exempt institution, and gifts to the University are tax deductible under the Income Tax Assessment Act. The University does not offer financial or tax advice, nor does it guarantee tax deductibility. All donors and prospective donors are requested to seek their own independent advice about such matters. Donors should also seek advice from their solicitors and accountants on possible capital gains tax matters. Cash and cheques received for donations will be banked and posted in the General Ledger using the One-Stop system by the Advancement Office cashier. They will then prepare a receipt in Raiser’s Edge and send it to the donor. Electronic Funds Transfers will be identified by Accounts Receivable Unit within FBS in the bank reconciliation process. They will send an email to the Advancement Office to advise them of the receipt and to confirm that it relates to them. The Advancement Office will then prepare a receipt in the Advancement Office System, Raiser’s Edge and send it to the donor. If the donor requires a tax invoice before making a payment, the invoice will be prepared by the Advancement Office in the Billing module of UniFi. A separate bill type (DON) is be used to easily identify these invoices so that Accounts Receivable Unit within FBS does not send dunning letters to the donors. The invoice’s GST status will be “out of scope” and the invoice can be set up to default to this when the donation revenue account code is used. Note there is no requirement to discuss the “voluntary” nature of the donation on the invoice since it will be tax deductible to the donor regardless (given they are a business). The invoice will be dispatched to the donor centrally by Accounts Receivable. Cash, cheques and electronic funds transfers will be receipted and banked by Accounts Receivable Unit within FBS, who will not send a receipt to the donor. The Advancement Office will obtain a report from UniFi on a regular basis so they can ascertain which donors have paid. The Advancement Office will then update records within Raiser’s Edge and issue a receipt (if deemed necessary). 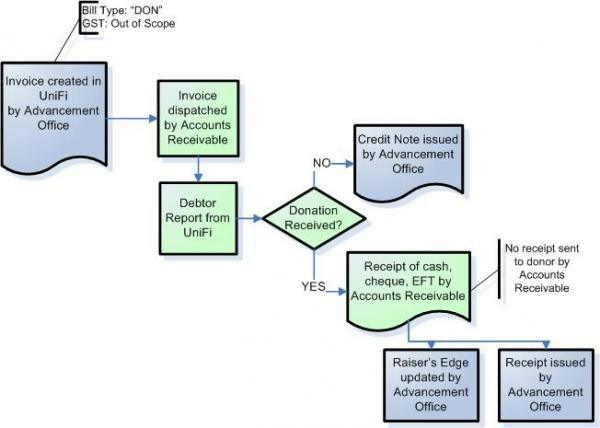 If a donor has changed their mind and does not wish to make the donation, it is the responsibility of the Advancement Office to issue a credit note within the UniFi Billing module. According to Senate Rules, the Senate must authorise the endowment of donation or bequest funding. If the donation or bequest is for a purpose for which the University has an established fund e.g. Cancer Research, no further approval is required by Senate. Refer to PPL 9.20.03 Managed Investment Portfolio. 2. The donor specifications allow a carry forward. Heads of organisational units or their delegates may use such funds to purchase goods and services relevant to the functions of their organisational unit. staff functions and entertainment, other than appropriate hospitality offered to visitors from outside organisations. Contract & Grants Accounting Section within FBS is responsible for the preparation of all certified financial statements in accordance with the conditions specified for all externally granted projects. Refer to PPL 9.10.03 Finance Reporting. Great care must be exercised in accepting donations from staff members. Some payments that a staff member may wish to make to the University may not qualify as a gift for income tax purposes and accordingly, should not be indicated as a gift on the receipt. Any payment greater than $100, which a staff member indicates is a gift to the University, will be referred to the Advancement Office. Depending upon the circumstances, the relevant head of the organisational unit may be contacted to ascertain the origin of the payment. A receipt will be posted to the staff member in due course. Complete the Staff Donations to UQ Form. All transactions dealing with the funds must be strictly authorised at "arm’s length" from the donor. Donations cannot be paid into an organisational unit controlled either directly or indirectly by the donor. Expenditure of funds from staff donations cannot be authorised by the person making the donation. Such expenditure must be approved by a person with a higher financial delegation than the donor. This form is used for persons other than staff who wish to donate funds to the University. This form is used for staff members wishing to donate funds to the University.